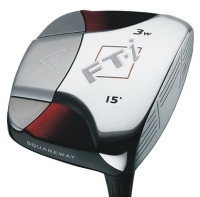 The Squareway Inertial Design positions discretionary weight to the extreme corners of the clubhead, raising the MOI for unparalleled resistance to twisting. The result is straighter and more forgiving shots hit over a wide area of the face. Multi-material construction combines a stainless steel face, sole and body with a lightweight, carbon composite crown so Callaway Golf engineers can move discretionary weight where it is needed most. Allows for a higher MOI to increase forgiveness and stability at impact for better accuracy.